A recent arrival to the Sydney hotel market, Veriu’s target market seems to be “people who prefer AirBnB”. At their Broadway hotel, opened in 2017, you’ll find slightly larger rooms (the smallest is 33m2) and kitchen or kitchenette facilities in almost every room. 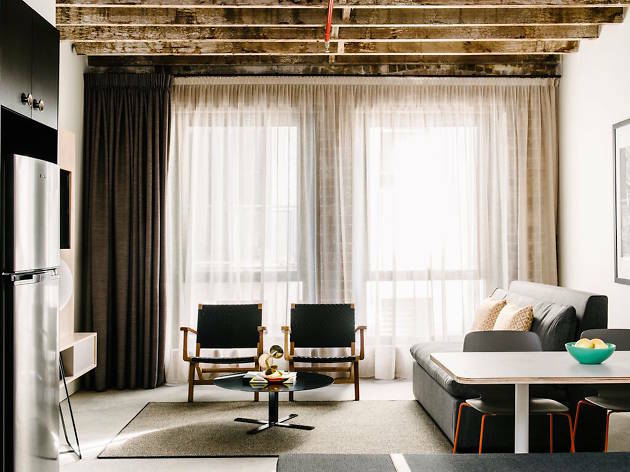 While the hotel is located on one of Sydney’s main strips, it is a little bit out of the downtown fray – closer to hipster haven Chippendale and bourgeois-bohemian Glebe than to the centre of town. 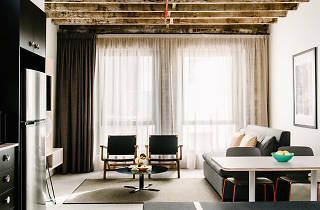 Decor is a little livelier than the polite hotel standards: the warehouse renovation has kept its exposed beams and added Scandi-style furnishings and brightly coloured art. Unlike an AirBnB, you still get 24-hour reception, which means you can keep your bags behind the desk the day you check out. You’ll also get free, fast Wi-Fi, access to Lekker rental bikes and plenty of health-conscious eating options at breakfast. Time Out tip: Veriu is under five minutes walk from one of our favourite Sydney venues, the Lansdowne. Head there for a $10 weekday lunch special, or catch a live band and eat slices of Detroit-style pizza in the evenings.